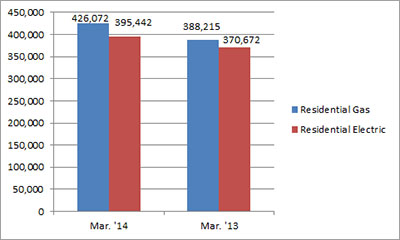 U.S. shipments of residential gas storage water heaters for March 2014 increased 9.8 percent, to 426,072 units, up from 388,215 units shipped in March 2013. 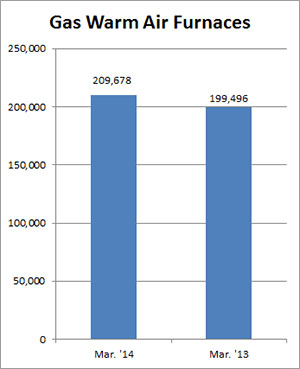 Residential electric storage water heater shipments increased 6.7 percent in March 2014, to 395,442 units, up from 370,672 units shipped in March 2013. For the year-to-date, U.S. shipments of residential gas storage water heaters increased 6.0 percent, to 1,162,979, compared to 1,097,072 units shipped during the same period in 2013. Residential electric storage water heater shipments increased 7.0 percent year-to-date, to 1,097,653 units, compared to 1,025,748 units shipped during the same period in 2013. Commercial gas storage water heater shipments increased 21.7 percent in March 2014, to 9,542 units, up from 7,840 units shipped in March 2013. 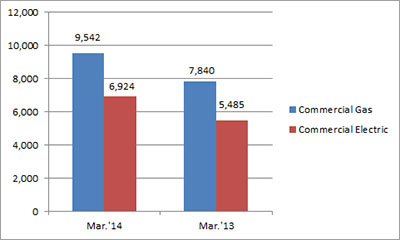 Commercial electric storage water heater shipments increased 26.2 percent in March 2014, to 6,924 units, up from 5,485 units shipped in March 2013. Year-to-date U.S. shipments of commercial gas storage water heaters increased 0.8 percent, to 24,705 units, compared with 24,508 units shipped during the same period in 2013. 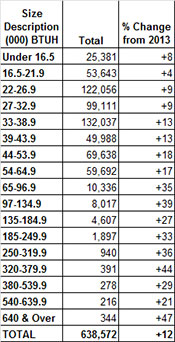 Year-to-date commercial electric storage water heater shipments increased 12.3 percent to 18,145 units, up from 16,151 units shipped during the same period in 2013..
U.S. shipments of gas warm air furnaces for March 2014 increased 5.1 percent, to 209,678 units, up from 199,496 units shipped in March 2013. 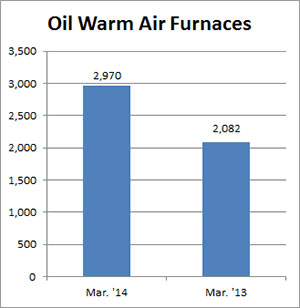 Oil warm air furnace shipments increased 42.7 percent, to 2,970 units in March 2014, up from 2,082 units shipped in March 2013. Year-to-date U.S. shipments of gas warm air furnaces increased 10.8 percent, to 600,467 units, compared with 541,735 units shipped during the same period in 2013. Year-to-date U.S. shipments of oil warm air furnaces increased 6.3 percent to 7,585, compared with 7,137 units shipped during the same period in 2013. U.S. shipments of central air conditioners and air-source heat pumps totaled 638,572 units in March 2014, up 11.9 percent from 570,434 units shipped in March 2013. 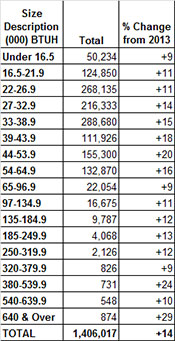 U.S. shipments of air conditioners increased 9.7 percent, to 415,218 units, up from 378,608 units shipped in March 2013. U.S. shipments of air-source heat pumps increased 16.4 percent, to 223,354 units, up from 191,826 units shipped in March 2013. 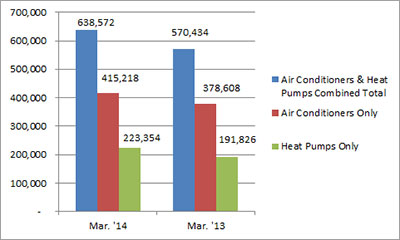 Year-to-date combined shipments of central air conditioners and air-source heat pumps increased 14.4 percent, to 1,406,017 units, up from 1,229,247 units shipped in March 2013. Year-to-date shipments of central air conditioners increased 10.4 percent, to 871,826 units, up from 789,588 units shipped during the same period in 2013. The year-to-date total for heat pump shipments increased 21.5 percent, to 534,191 units, up from 439,659 units shipped during the same period in 2013.